Microparticles (MPs) are circulating membrane-bound vesicles derived from blood and endothelial cells via a highly regulated process. They are immunomodulatory and have been implicated in autoimmunity and Systemic Lupus Erythematosus (SLE). We recently showed that MPs derived from SLE patients contain higher protein and activity levels of type II transglutaminase (Tgase). Tgases are protein crosslinking enzymes whose activity increases antigenicity of certain proteins. This enzyme family has been implicated in SLE pathogenesis, perhaps by stimulating autoantibody formation against such proteins as C3, which are major Tgase substrates. The cell source of MPs responsible for increased Tgase activity on SLE MPs is unknown. We explored the hypothesis that interferon, a key cytokine in SLE, could promote Tgase activity on human monocytes and their MPs. MPs were isolated from non-adherent human monocyte THP-1 cells by differential centrifugation of conditioned media in cultures treated with or without 1000 U/ml interferon gamma or 10-1000 U/ml interferon alpha for 24- 72 hours. Tgase activity was measured on the MP sample and THP-1 cell layer using a standard radiometric assay. Tgase protein levels for type II Tgase and factor XIIIA were measured in cells and on MPs with Western blotting. Similar experiments were carried out with human umbilical vein endothelial cells (HUVECs) and Jurkat cells (human T lymphocytes). An increase in type II Tgase protein as evidenced by Western blotting was noted on the cell layer of interferon gamma treated THP-1 cells. This corresponded to a slight, 1.56 fold increase in Tgase specific activity after interferon gamma exposure at 72 hours (p=0.18). 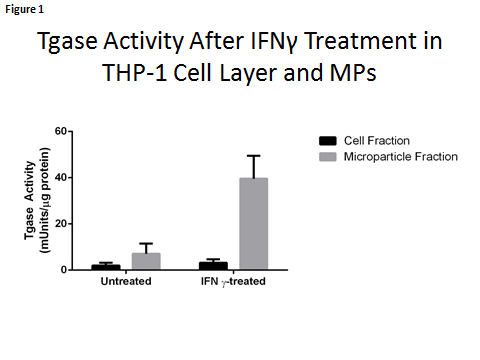 Interestingly, a dramatic increase in Tgase activity was observed on MPs from interferon gamma treated cells with specific activity increasing 5.61 fold (p=0.02) over control MPs (figure 1). There were no differences in protein levels of factor XIIIA nor were there increases in Tgase activity with thrombin treatment, which activates latent Factor XIIIA. HUVECs and Jurkat cells did not respond similarly. 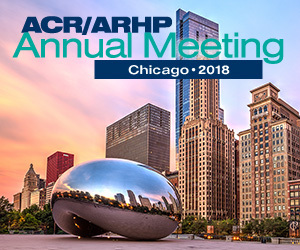 Interferon alpha did not increase Tgase activity on any of the cell types tested. Interferon gamma specifically increases Tgase activity and type II Tgase protein levels on human monocytes and has marked stimulatory effects on Tgase activity on monocyte-derived MPs. Increased Tgase activity may contribute to autoantibody formation through post-translational modification of proteins, such as C3, and their location on MPs may be important. Tgase inhibitors ameliorate SLE in animal models. Our data lend additional support for Tgase inhibitors as potential therapies for SLE.